Oh what a day this was. It was a bright bright sunny day. 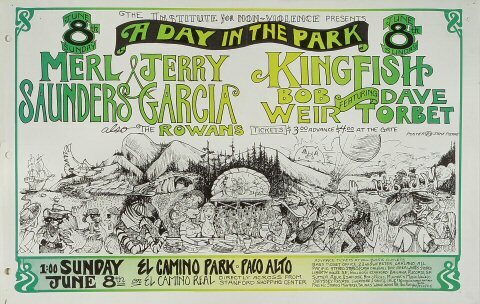 Kingfish and Jerry with Merl, what can I say. I lived in Palo Alto through the 3rd grade. We moved twenty miles away. While I was living in Palo Alto there was a Willie Mays day held at this same park. I had my glove signed. (as a kid I lost it) To be back at that show years later flying as high as I could get was a trip.